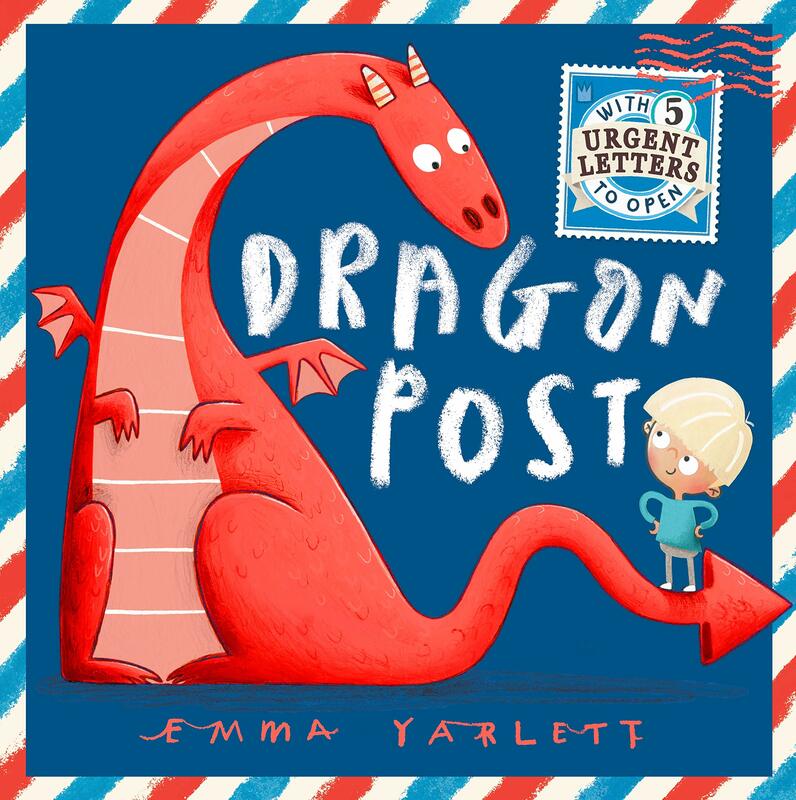 You'll find interactive pockets of post inside, the envelopes already torn open by small hands which, quite rightly, should go nowhere near a sharp letter knife! Their individual postmarks are funny, as are the letters inside! Now, Early Learning is very important and I don't just mean reading skills, although they're vital too. One of the only things I rue about being so blatantly unfit for parenting is that I don't get to read to my kids at night, or listen to them read to me. To be clear: I don't have any children. See "unfit..." etc. 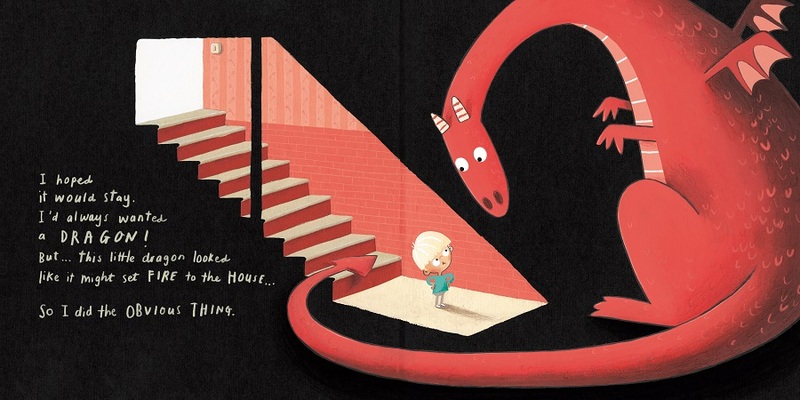 One day young Alex finds a big Day-Glo red dragon has come to live with him in the cupboard under his stairs. Actually, it's more of a cellar which is thankfully both a little roomier and the perfect choice for maximum visual impact: the daylight floods in from the hallway, illuminating the fork-tailed, scaly lummox whose form positively radiates against the pitch black darkness. Also note the sense of scale: just like Luke Pearson in HILDA AND THE MIDNIGHT GIANT and Bryan Hitch in ULTIMATES SEASON ONE Emma Yarlett understands that a character needs to challenge its confines and bleed off the page while bending down in order to impress upon the observer just how gigantic they are. "I hoped it would stay. "I've always wanted a DRAGON!" "So I did the obvious thing. "I wrote to the FIRE BRIGADE." Exhibit number one, then, is the fire brigade's response which, as you'd expect, is calm, formal, authoritative, practical, detailed and -- it is not!!! 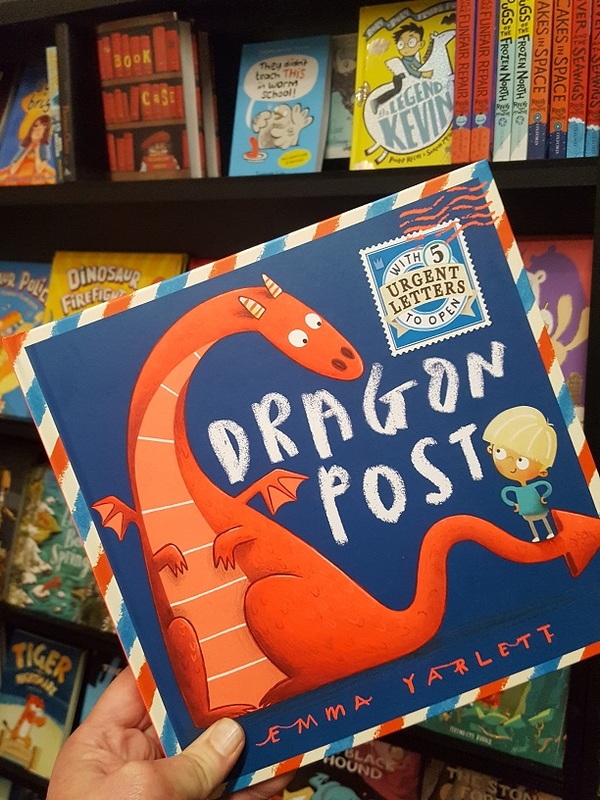 Far from self-assured, it is one long alarmist panic which pours the proverbial petrol on an already flammable situation before suggesting that Alex douses the dragon with water every day. 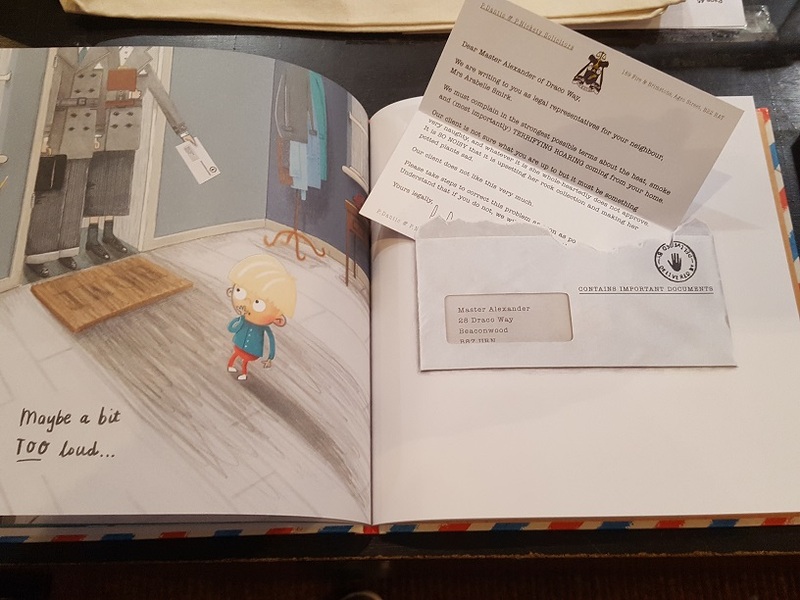 Lovely contradiction between the text and art, there, just like almost everything by Jon Klassen including SAM & DAVE DIG A HOLE, written by Mac Barnett. If I were that fish in the fishbowl, whose waters are waiting to be sacrificed to Project Douse The Dragon, I'd be a little less sedate. Nevertheless, it eyeballs Alex accusingly. Now that we have the not inconsiderable matter of Health & Safety sorted out, it's time to move onto Nutrition. 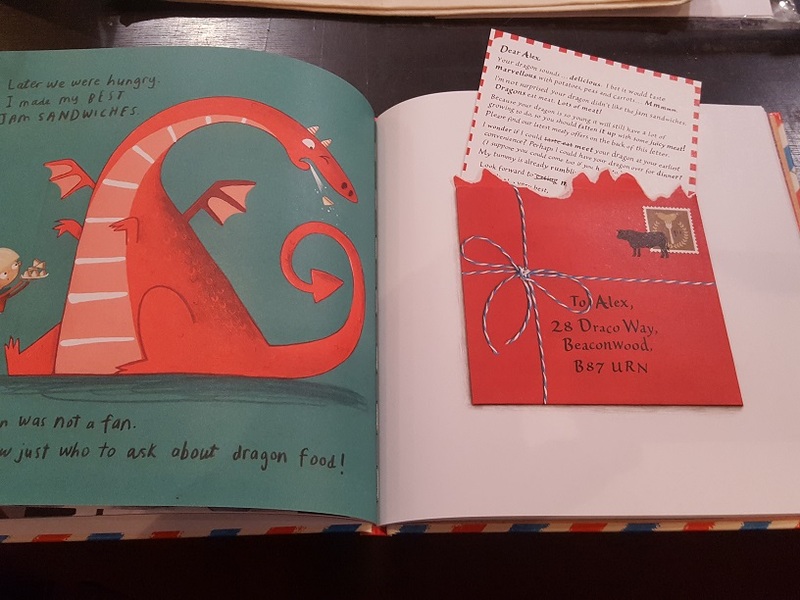 Not having enjoyed the benefit of a dragon's dietary requirements as expertly detailed by Philippa Rice in ST. COLIN AND THE DRAGON, Alex discovers that jam sandwiches simply don't cut the mustard. I'd have tried Nutella and crisps in the softest white bread you can bake. I'm not just a cook, I am a chef! "I wonder if I could taste eat meet your dragon at your earliest convenience." "Taste" and "eat" are struck-through. There are several other worrisome issues, not least of which are the disquieted neighbours, and the solicitors are equally funny, but one should remember above all that dragons aren't renowned for being domesticated and taking them for daily walks is impractical: they need to stretch their wings as well as their legs, so daily flights are advised. Thankfully, you can simply sit on their backs rather than exert yourself too. This sounds ideal for someone like me. I had a retriever called Leela who refused to retrieve. You'd lob a length of green garden hose about the size of a decent bone as far away as you could, and she'd certainly attempt to locate then grab it, but then you'd have to chase the lolloping, ecstatic hound for a full five minutes before she'd even begin to consider surrendering her prize. Yup, our dog definitely understood the importance and entertainment value of exercising her teenage boy several times daily. Aaaaaanyway (reprise), this is a mischievous joy whose cover stands out on Page 45's Young Readers shelves like some radioactive meteorite. I am a sucker for any sort of interaction, especially one which requires me to pluck something out then pop it back in, like Eeyore and his burst balloon in 'Winnie The Pooh' on his birthday.